I’ve been following the light and shadows in my garden. 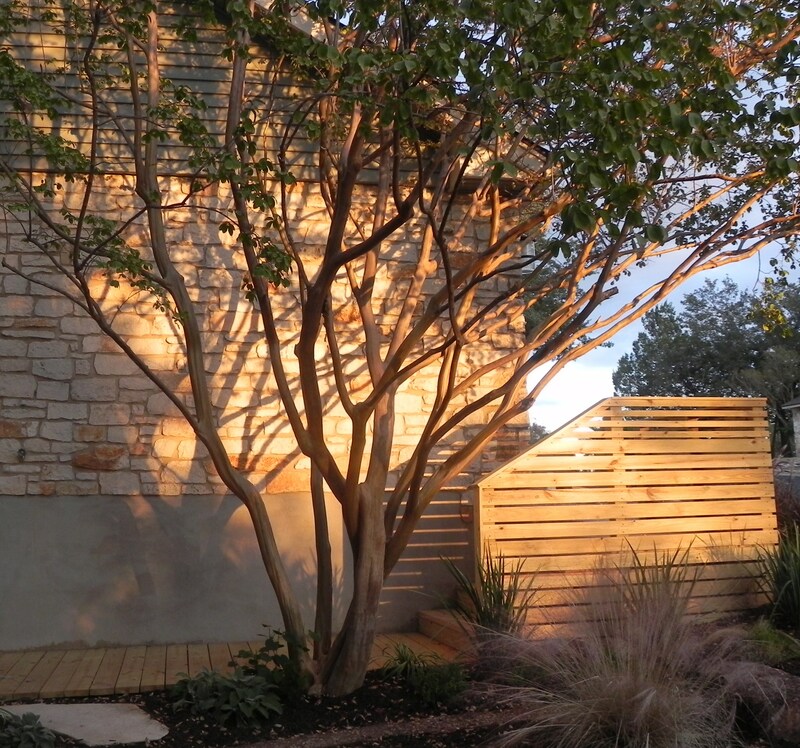 A late afternoon peachy glow projects along our long entry wall – “Showtime!” says the crepe myrtle. (above) I’d like to plant something that will be sculptural against the wood step enclosure (on the right)…any ideas? (below) I also love how the afternoon sun skims across the barrel cactus near the driveway; the yellow spines glow a welcome home kiss to us as sweet as any showy bloom. This actually doesn’t do the (lower) barrel cactus justice; I need to capture that moment. (below) My agave looks dewy in the morning light – even during a summer drought; light filters through a huge oak tree from nine till about ten, and the sharp-edged butterfly agave has a soft watercolor moment each day. Where do shadows bloom in your world? 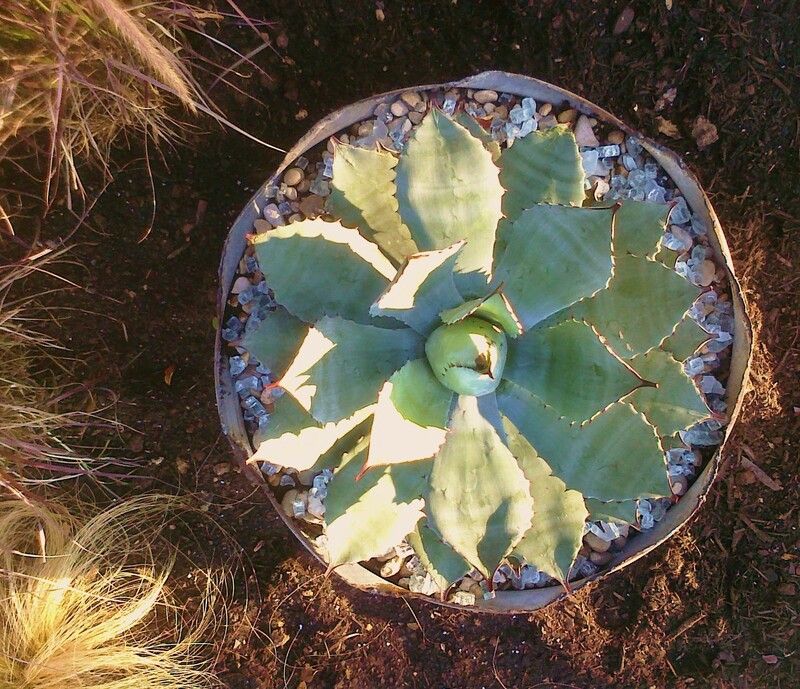 Previous Santa-Rita cactus~ glows softly and carries a big stick Next Roll the Music, We Have a Winner…. 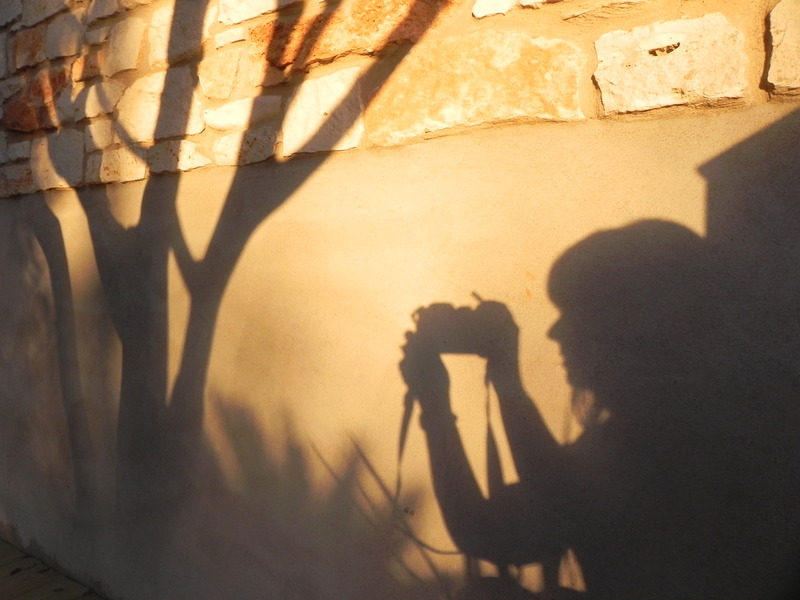 Beautiful photos Cyndi, I love your take on light and shadow. You have a perfect spot for it. Something sculptural would look great against that wall. A large agave might work if there’s enough sun and space, it would need to be simple because the strong horizontal lines that are existing. 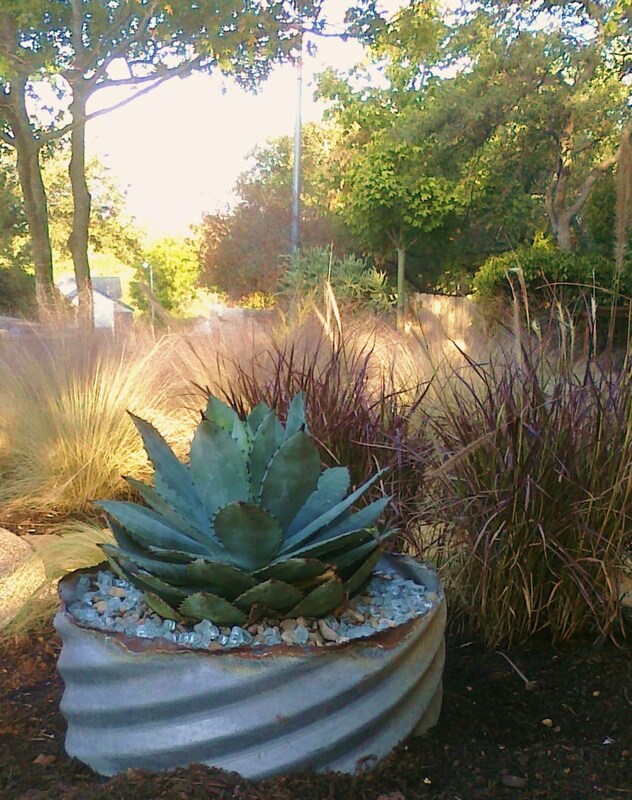 Thanks, Shirly- agree that something fat will shadow well on that fencing – too narrow a space for agave…but maybe paddle cactus, maybe even in a pot, hmmm…. Beautiful photos–the fall light shows magnificently! And your muhlies–I wish mine looked like that! Would a dwarf palmetto (Sabal minor) be too wide for the spot in front of your wood? Love that shadowy self-portrait! The garden looks lovely too. 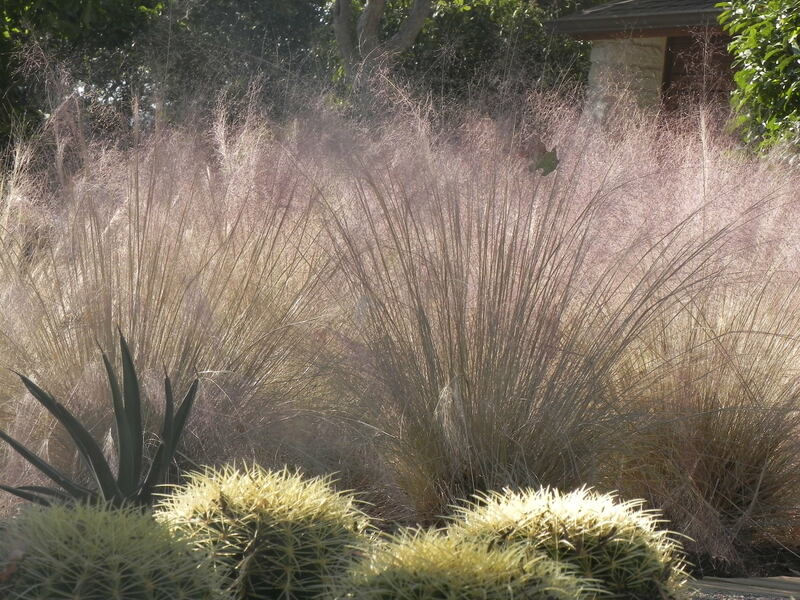 What a spectacular array of flora around your place, Cyndi. My wife and I are inspired by your sense of style and balance, and the way you’ve integrated a lot of environmetal stewardship (no pun) in creating your surroundings.